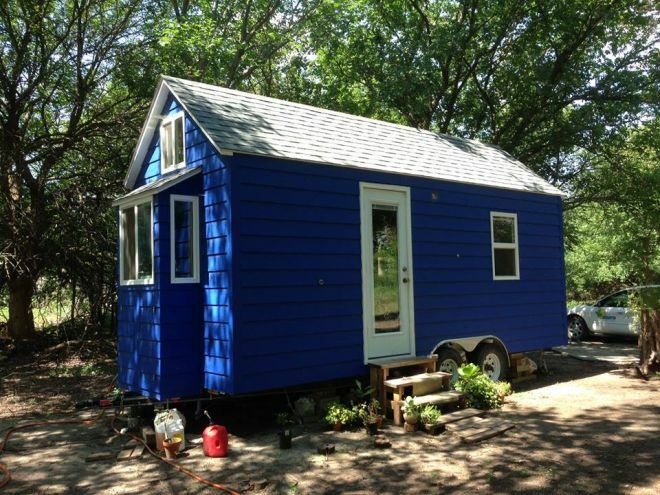 If you ever needed proof that a DIY dream can become a livable reality, just take a look at the Tiny Blue House. Originally built in 2014, this tiny home on wheels has been awing and inspiring wishful dwellers in Hesston, Kansas with its sheer beauty and elegance. Fast forward to the present, and the little blue house is in need of a new owner, as stated on Tiny House Listings. 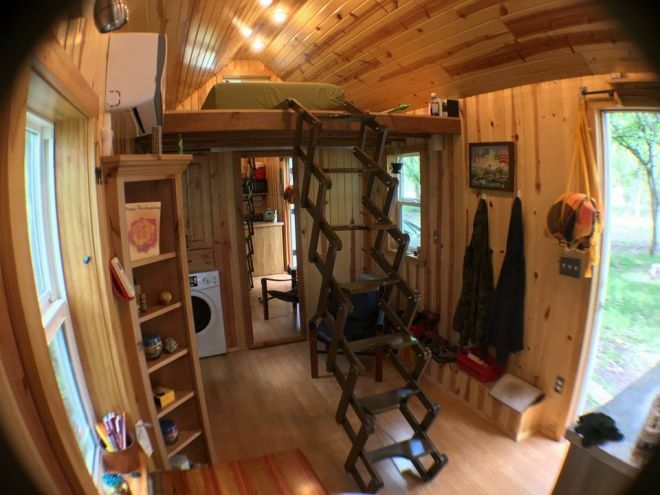 For $37,500 you get a gorgeous tiny house that has been built, lived in and loved by its original owner for the past two years. It must be difficult to say goodbye to such a sweet little abode, especially one that has been created and crafted with as much care and precision as this tiny home. Whether you are a prospective tiny house buyer, or you are an enthusiast for the simpler side of living, this Tiny Blue House is a joy to explore. Let’s experience the greatness that comes from this compact dwelling and everything that makes it a cherished little treasure. 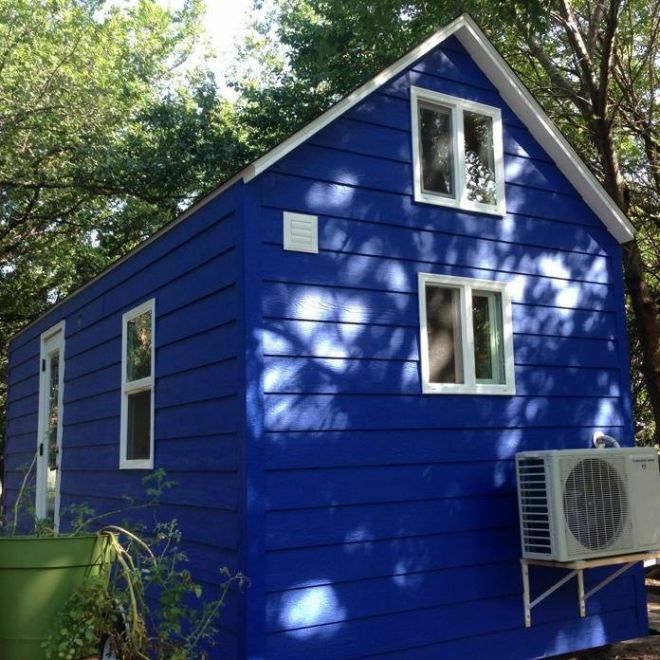 This Tiny Blue House is an 8-by-20-foot (2.4-by-6.1-meter) wooden piece of artistry. The beautiful royal blue siding, along with the sheer white roofing, doors and windows, create a heavenly and pristine look in this stunning little cottage. According to its listing, the Tiny Blue House has everything you could possibly need to live comfortably. Around the back of the house, you will find a split unit air conditioning system that heats and cools the inside of the home, and there are plenty of interesting features inside to satisfy all living necessities as well. Come and look inside, and you will see what we mean. On one end of the house you will find the living area, bedroom loft, and the bathroom. 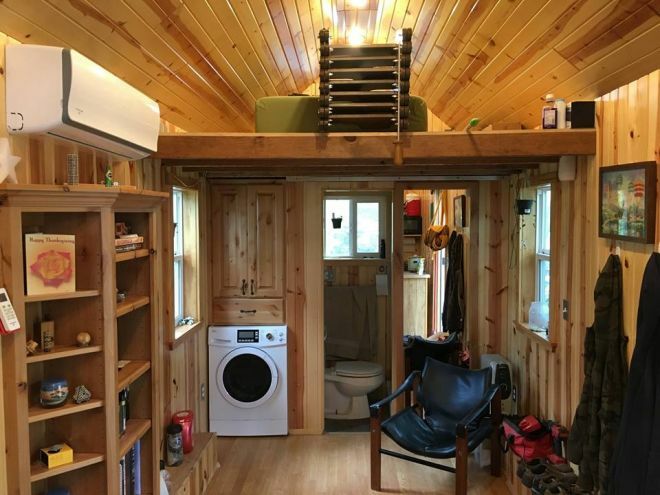 As you can see, all the best tiny living facilities are well within your reach: there is a heater, plenty of shelving and storage space, your own washer and dryer and a full length mirror that cleverly conceals the bathroom area from view. 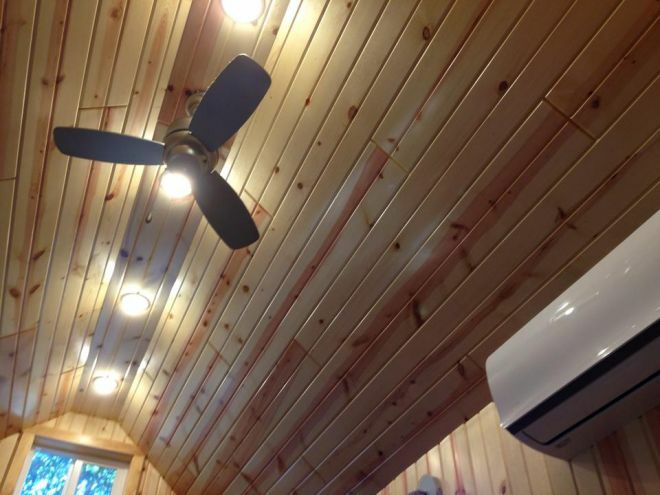 The Tiny Blue House’s walls and ceiling are made with tongue and groove pine, and the attention to detail that went into the crafting of every component of this tiny home is truly commendable. See that lever on top of the loft? That is there so you can easily pull out or stow away the handmade ladder that gets you to the upper level. This is what you see when the ladder is in full view. Such a great idea, don’t you think? You can store away the ladder whenever you have visitors come over, or if you feel like you could use a bit of extra space during the day. While we are looking straight ahead, let's step inside the bathroom. The bathroom area ingeniously uses its compact space to its full advantage. 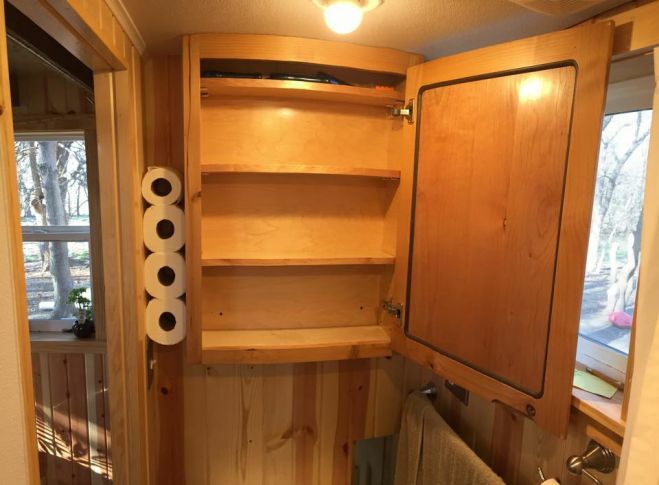 A toilet, a shower, towel racks, windows and a handy little cabinet all fit into this space in a very orderly manner. Here is the view from the outside. 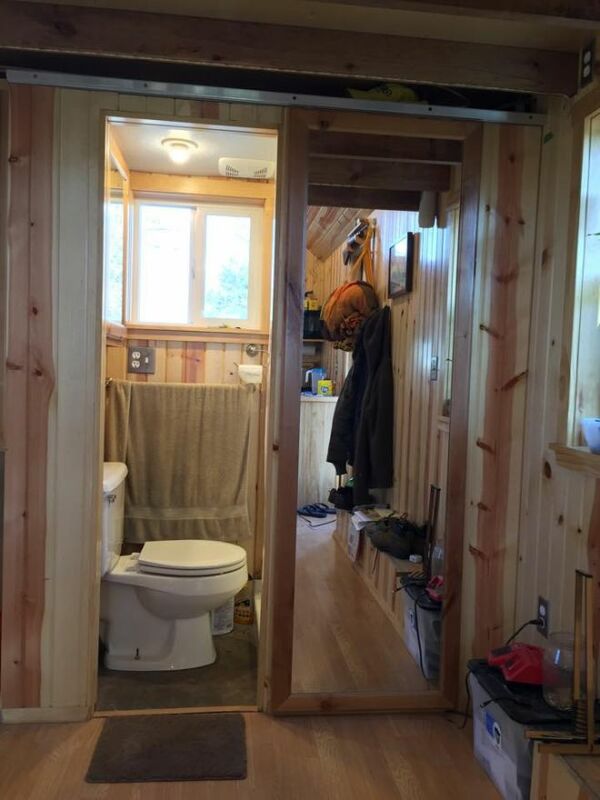 The toilet is on the left, and the shower is hidden away on the right. That mirror creates an interesting optical illusion of larger space - it almost looks like there is a concealed hallway right next to the bathroom. 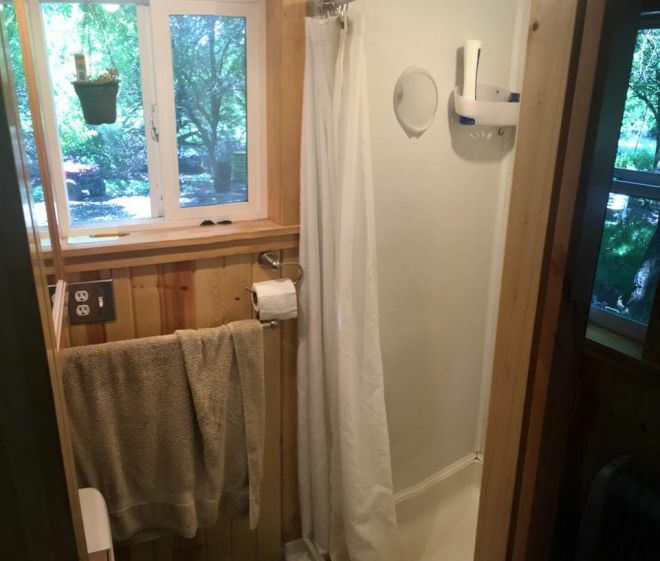 Before we move on, here is a look at the full sized shower installed in the Tiny Blue House. No cold showers here (unless you actually want them), as the Tiny Blue House has its own on-demand propane water heater. The water heater is actually stowed away in the kitchen, at the other end of the house. Which actually leads us quite well into where we are going to next. Now that we have looked at the bathroom area, let's start heading back in the opposite direction. First stop, the sleeping loft. It is as simple as it needs to be - with bedding, windows and plenty of extra lighting. There are actually seven LED lights installed on the ceiling, helping illuminate the sleeping area as well as the whole house. The 800 lumens LED lights are evenly spread across the whole length of the house, cleverly adding the right amount of brightness to the entire place. Finally, let's finish this tour by looking at the kitchen. We just love the attention to detail that went into the kitchen and dining area. The folded out table to your right is made with a combination of yellow hedge wood/Osage orange from Kansas, as well as Brazilian redwood. That island on the left is completely mobile, and you can easily move it around depending on how you want to use the kitchen. Here is a closer look at the kitchen. 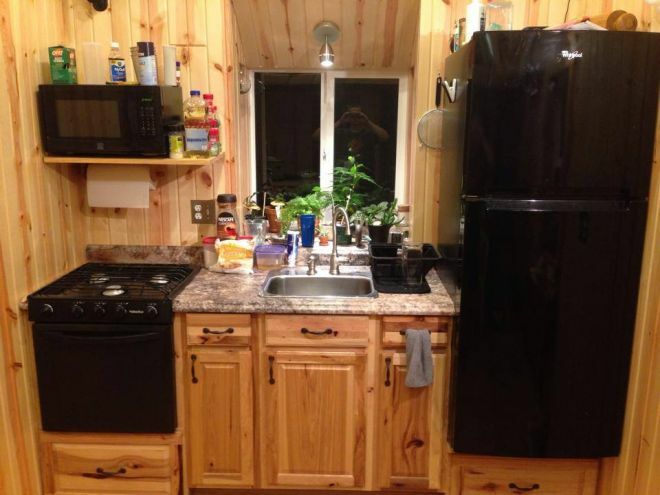 Along with all the best appliances, including a propane stove, microwave and a full size refrigerator, there is plenty of creative storage spacing in this area. 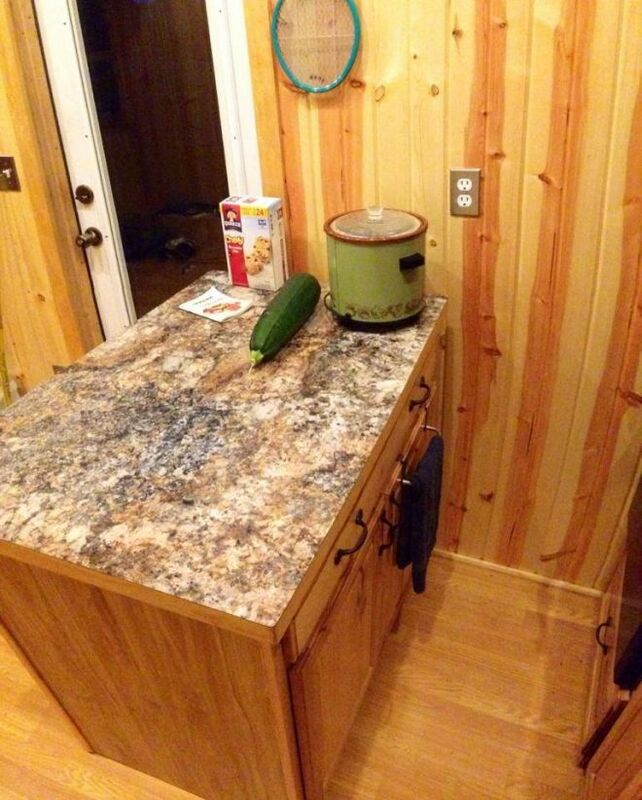 Notice the drawers underneath the stove and fridge? Those are actually there to elevate these appliances so that you don't need to bend down to reach them. Clever idea, with an extra bit of functionality too! Those bay windows are a nice touch as well. Such a great place to add a bit of decorative flair of your own, adding your own plants or any extra adornments to your tiny kitchen. And to conclude our tiny tour, here is a closer look at that movable kitchen island. This has been especially created to provide some much needed storage space for food and kitchen utensils. Tiny homes always benefit from clever use of storage, and the Tiny Blue House seems to use all of its facilities with a great sense of efficiency. Livable, beautiful, and very precise, the Tiny Blue House should be on top of every prospective tiny home buyers’ viewing lists. The workmanship and attention to detail that went into this wooden cottage proves that you don’t need to be an established building company to create the perfect wheeled home. 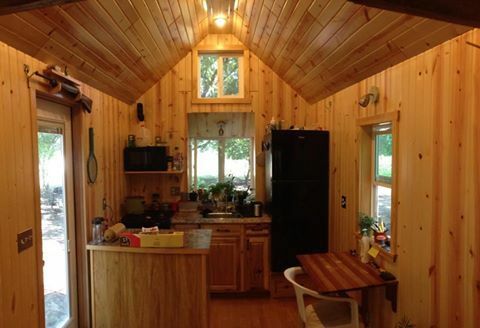 Whoever manages to snag this tiny house for themselves is sure to be a very happy customer.